Ada pertanyaan untuk The Lookout Cave Underground Motel? Direnovasi pada tahun 2015, The Lookout Cave Underground Motel menjamin penginapan yang menyenangkan bagi para tamu di Coober Pedy baik untuk tujuan bisnis maupun plesiran. Hanya 6.7 km dari sini, hotel bintang 3 ini dapat secara mudah diakses dari bandara. Dengan lokasinya yang strategis, hotel ini menawarkan akses mudah ke destinasi yang wajib dikunjungi di kota ini. Di The Lookout Cave Underground Motel, pelayanan istimewa dan fasilitas yang unggul akan membuat pengalaman menginap Anda tidak terlupakan. Untuk kenyamanan para tamu, hotel ini menawarkan WiFi gratis di semua kamar, satpam 24 jam, layanan kebersihan harian, check-in/check-out cepat, penyimpanan barang. Semua akomodasi tamu dilengkapi dengan fasilitas yang telah dirancang dengan baik demi menjaga kenyamanan. Hotel ini menawarkan berbagai pengalaman hiburan unik seperti lapangan golf (sekitar 3 km), taman bermain anak, taman. 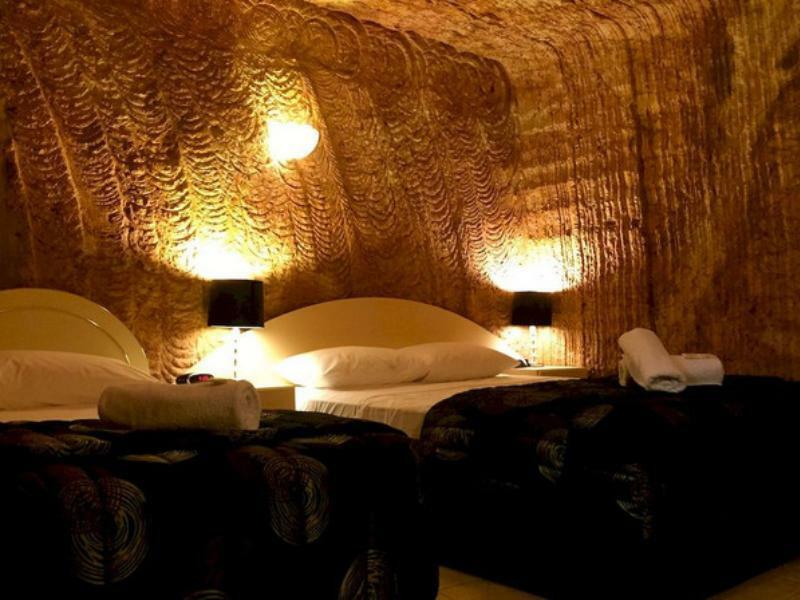 The Lookout Cave Underground Motel adalah pilihan yang cerdas bagi para wisatawan yang berada di Coober Pedy dan menawarkan pengalaman menginap yang menenangkan setiap saat. Transfers are available to and from the airport. These are charged AUD 20 for a 4-guest round trip. Bed was comfortable, room was a bit expensive but I guess that's just coober pedy. Once you're in your room its just like any other motel. The area on top of the roof is a great place to look out over coober pedy. Coober pedy itself is an unattractive dump. This underground motel is well decorated and we feel it an awesome place to stay, it costs us a little more money but the value is not low. It is our 1st time to experience an underground accommodation and we loved it. It is highly recommended to stay at this motel if you are travelling to Coober Pedy. A hidden gem. These guys have an amazing underground experience waiting for everyone. Clean plenty of room with a well appointed motel. We stayed in room 5 which away from the ‘main corridor ‘ When we went to view the rest of the premises it was amazing. Great underground motel. Very cool and beds comfortable. I would definitely recommend! just want to experience sleeping underground. My wife and I had two nights here and thought that it fulfilled our expectations of an interesting accommodation concept with style. A very pleasant surprise, only negative was our first nights sleep badly disturbed by a very noisy late arrival group of Asian tourists talking excitedly unttil late after midnight leading us to havw to get out of bed and tell them to have some consideration for others. The management were very responsive next morning and issued warnings to those staying on for another night. The second nightmarewas significantly quieter though banging doors in the morning rush to get moving were also quite loud. This is more a reflection on other ggueststhan the accommodation but the underground layout exacerbates the pproblem with hard reverberative surfaces.